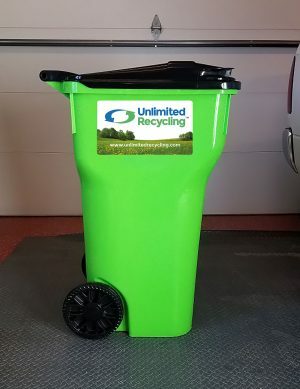 Unlimited Recycling, Inc. can provide your company or institution with our aggressive, proactive Food Waste Composting Program to include the pickup and composting of all food and other compostable wastes generated at your facility. Fruits, vegetables, dairy products, grains, bread, unbleached paper napkins, coffee filters, eggshells, meats, and newspaper can be composted. If it can be eaten or grown in a field or garden, it can be composted. Compostable tableware, cups, and bags are also acceptable! Items that cannot be composted include plastics, grease, glass, and metals — including plastic utensils, condiment packages, plastic wrap, plastic bags, foil, silverware, drinking straws, bottles, polystyrene or chemicals. Waste composted at state certified/approved facilities. Documentation provided to certify composting. 64 Gallon Carts provided for the central collection of food wastes simplifies collection. Complete training and educational materials for management, housekeeping, and employees.